Locking wheels on the base of this display make positioning the whiteboard simple. Each of the (5) castors can be locked into position to keep the easel in place once in a desired location. The base of the board has a pen tray to keep markers right at hand, and the included magnetic eraser can fit on the tray or be attached to the board itself. This display is in stock today for fast despatch to Sydney, Melbourne, Brisbane, Perth, Adelaide, & anywhere else nationwide. Order by 2pm EST for same day shipping when in stock! Pen tray at bottom perfect for holding markers, included eraser, & more! A rolling whiteboard stand is a versatile display including many features that make it a must have for any classroom or office. The portable easel has a large 930 x 660 mm writing area for dry erase markers that is also magnetic. The included (3) round magnets can hold posters for display, and the top of the board has a flipchart holder for paper up to 665 mm wide. Beneath the flipchart bar are (2) hooks for holding an entire pad of paper. 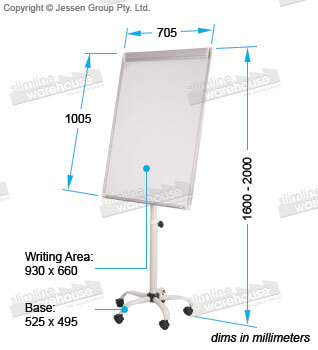 This rolling whiteboard stand, like a white board with wheels or dry erase easel, is a height adjustable display to allow people of different heights to be comfortable during use. Change the height between 1.6 & 2m using a knob on the back to secure the centre pole in position. The entire stand is made from powder coated steel to provide a long-lasting display that can be easily positioned.